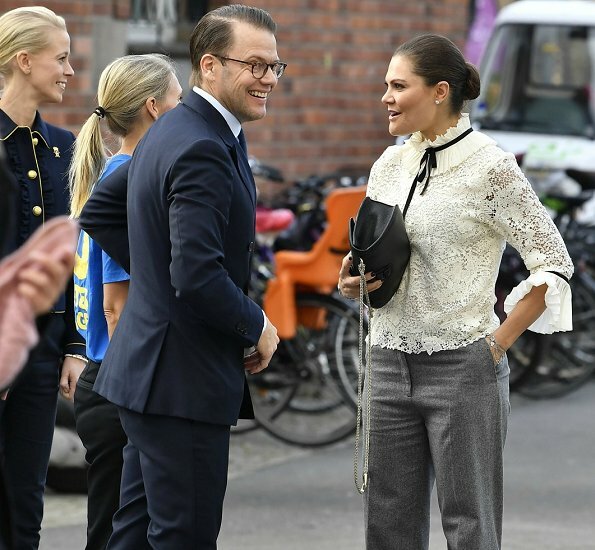 On October 20, 2017, Crown Princess Victoria and Prince Daniel of Sweden attended the Generation Pep's Pep Forum at Karolinska Institute in Solna, Stockholm. 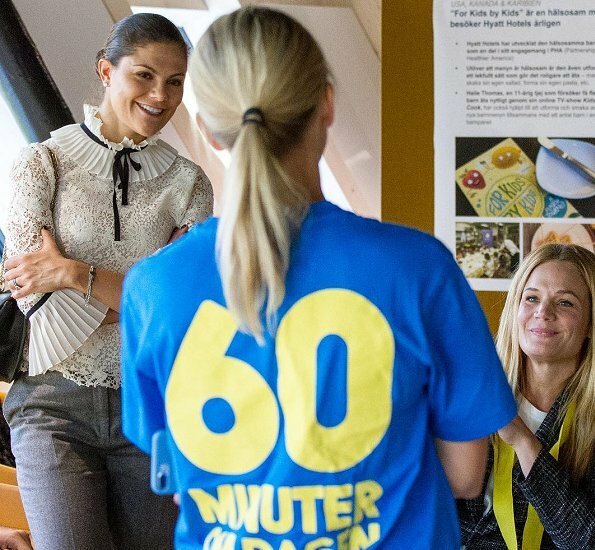 Generation Pep (GEN-PEP) is a non-profit organisation initiated by the Crown Princess Couple, works to spread knowledge and engage both people and organisations in a joint effort to make it easier for children and young people to live a healthy life. 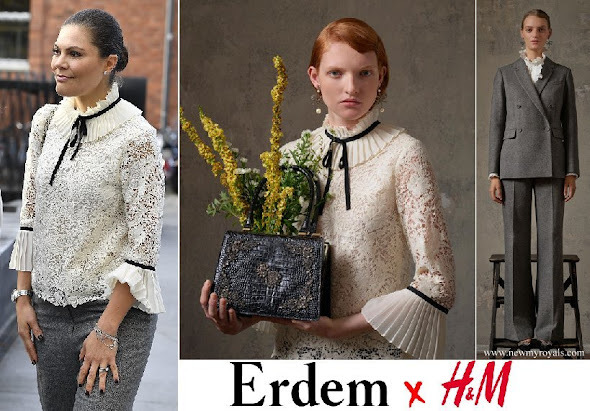 (Crown Princess wore a blouse and trousers from Erdem x H&M Collection). That day a princess wore a cute top from the store and pants like the rest of us and we felt better because the pants looked just as ill-fitted as they do when we wear them. That day! I think I like this look. I can take it as a modern day look with a retro twist. The trousers are classicly cut, elegant, fit her well and are easy to combine with anything - a great basic piece. 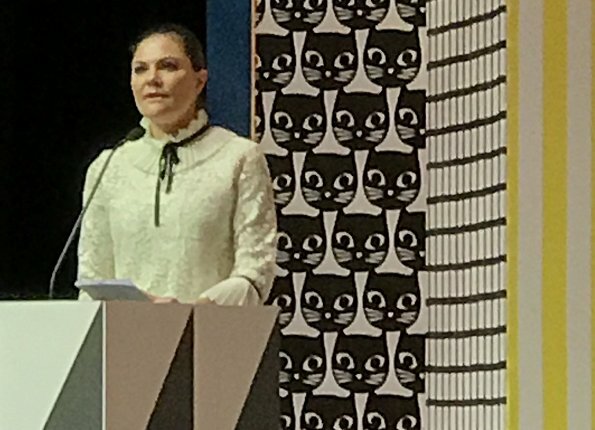 The blouse is retro and intriguing, it has lots of features but thanks to the neutral colour and the combination with a good base (the trousers) look edgy and not costume-y. I would have prefered a simpler bag (no chains, rich texture and such), but overall a solid look. I hope her shoes were un-fussy. The hair, although boring as usual, kind of works here, because no extra focal point of interest was needed, and it´s neatly out of the way to let the blouse be the focus instead of competing with it. Agree on most points. Personally I don't like tomboy trousers - with few exceptions. And I don't like it here, because for my opinion Victoria is too well-toned for trousers like this. In this way these trousers are too much boy and less girl. The blouse saves it a bit. Usually I like her bun and it works with the blouse, taken as a whole it's too strict. Agree - 19th century governess (btw, the D of C wants her black ribbon back...) combined with edgy "let's head out to a club" pants. What was she thinking? Could Victoria and the D of C not each have a black ribbon? There is far too much going on in that blouse to please my taste. It must be a Scandinavian style at the moment... The tie around the neck. 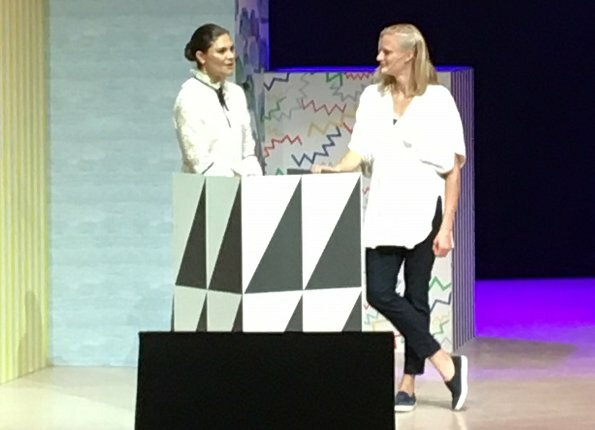 There is a Swedish designer, Romisch, who does a lovely golf/sport clothes line, but the gals here can't stand the 'tie thing'. Funny, heh. There's really nothing I like about her outfit, or hair. But at least she looks happy. Le pantalon est trés mal coupé ,le tissu de mauvaise qualité ,un chiffon .